Agnes George received her Bachelor’s degree in Physics from Mahatma Gandhi University (Kerala, India) in 2015 and her Master’s from Christ University (Karnataka, India) in 2017. During her studies, she worked on projects in Materials Science and Optics, including thin film and nanoparticle preparation and their characterization as well as the emission lifetime of fluorescent molecules. 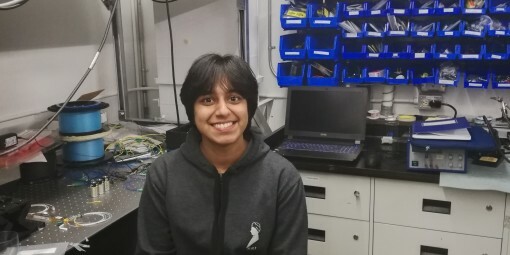 Later, she joined the Light and Matter Physics (LAMP) group in the Raman Research Institute (Bangalore, India) to work in Ultrafast and Nonlinear Optics under the supervision of Prof. Reji Philip. Her project focused on the nonlinear optical characterization of materials and laser produced plasma. Agnes is an INSPIRE scholar. She joined the group Nonlinear Photonics group as a doctoral student under the supervision of Prof. Roberto Morandotti. Her work will focus on the characterization of nanolasers.